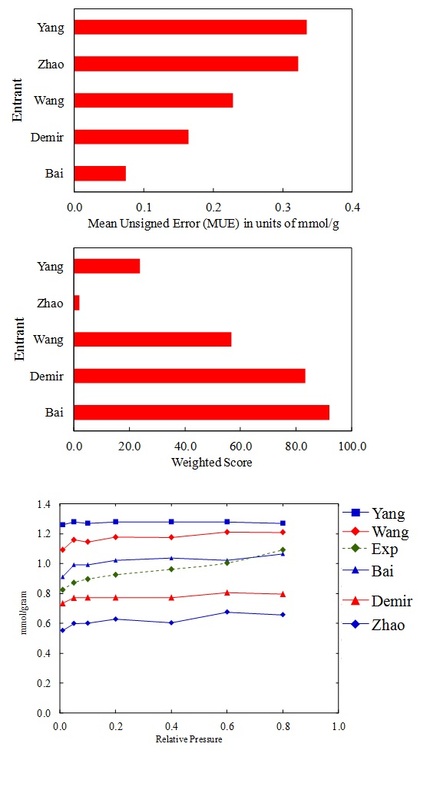 The results of the Seventh Industrial Fluid Properties Simulation Challenge were announced at a special session at the AIChE Annual Meeting in Pittsburgh on November 1, 2012. The entrants were challenged to predict the adsorption isotherms of n-perfluorohexane (n-C6F14) in BCR-704 zeolite at a temperature of 293K and at various relative pressures. Peng Bai, Pritha Ghosh, Jeffrey Sung, Daniela Kohen, J. Ilja Siepmann, and Randall Q. Snurr (U. Minnesota, Northwestern U., and Carleton College) were named Champions of the 7th Challenge. Barış Demir and M. Göktuğ Ahunbay (Istanbul Technical U.) were named 1st Runner-Up. Manuscripts describing the challenge, benchmark data, and entries will be published in a future special issue of Fluid Phase Equilibria. Check fluidproperties.org for more info.